New products from Radio Archives this week! All new products created by Radio Archives are discounted 50% the first week. Discounted 50% the first week. What chance had Civilization to survive — with Smiler Miordan’s vast Underworld Union coming to full power... with his new and deadly plague destroying all who dared oppose him?... Could Nita’s pitifully brave coup stay the Murder Tide long enough for the Spider, himself infected, to organize an army of patriotic lepers?... One of Richard Wentworth’s most stirring crime sagas! “There’s a madness that gets in me when the Spider walks....” Richard Wentworth once admitted. Once more,the incomparable Nick Santa Maria reads another thrilling Spider exploit. 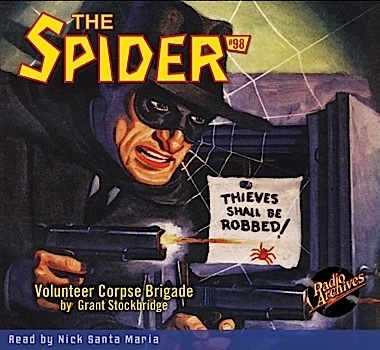 Volunteer Corpse Brigade originally published in The Spider magazine, November, 1941. Operating out of the supposedly haunted Montgomery Mansion, Secret Agent “X” ventures forth in a bewildering array of false identities to infiltrate the darkest underbellies of the Underworld—and destroy it from within. The only clue to his true identity is his haunting whistle…..
Weird symbol of ruthless greed and savage murder, that crimson talisman of the Scorpion flared its scarlet hue from skyscraper pinnacles. For the dreaded Scorpion had finally struck, seizing full power of the metropolis. And Agent “X”, greatest impersonator of the century, knew that he had met his match in a devil who could change his identity with the speed of light. The Scorpion, criminal master-mind is trying to gain control of all the mobs in the city for one hellacious night of looting. Not only must The Agent uncover the masquerade covering the Scorpion’s operations, he must clear Betty Dale of the crime—of helping Secret Agent “X”! The enigma of enigmas, Secret Agent “X” has been deputized by a high government official to battle the darkest, most diabolical enemies of America before they sink their poisonous fangs into the nation’s healthy core. Faceless and unsung, Secret Agent “X” infiltrates these threats in a bewildering array of disguises. Although Paul Chadwick created Secret Agent “X”, G. T. Fleming-Roberts contributed the most stories to the character’s canon, numbering at least twenty. Known as a mystery/crime writer, Fleming-Roberts also contributed to series characters other than Secret Agent “X”. Most notably, Diamondstone the Magician, The Green Ghost, and Jeffrey Wren were crime solvers of a sort that Fleming-Roberts enjoyed creating; magician detectives. This interest in slightly different crime tales probably contributed a great deal to Fleming-Roberts’ work on Secret Agent “X”. 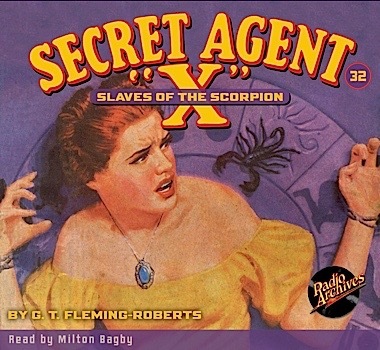 Follow the Man of a Thousand Faces as he confronts the menace of Slaves of the Scorpion, ripped from the pages of Secret Agent “X” magazine, June 1937 and read with chilling intensity by Milton Bagby. 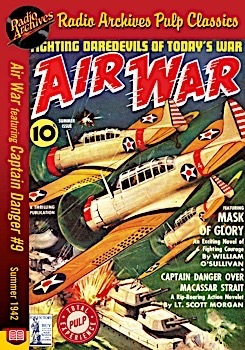 Skid Carr, crop-dusting pilot from the U.S.A., finds himself in the middle of a Nazi spy plot that it takes a slue of bombers and fighters to break up! Flight Lieutenant Brandon backs a comrade’s play all the way to the jaws of death. It was curtains for somebody — so Commander Stickney decided to play the final act alone! Lieutenant Becker had an impossible choice to make — until the decision was taken out of his hands! Way down South Uncle Sam is training a tough army to destroy the Axis air armadas! Audiobooks, Books, Double Novel Pulp Reprints, and Old Time Radio Cassettes, Reels and Audio CD sets are all in the Bargain Basement. 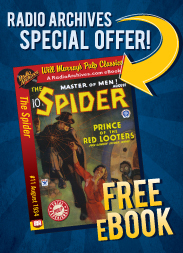 Two Old Time Radio sets and two Pulp Audiobooks at a 50% discount are in the Bargain Basement each newsletter. Large reel to reel collection of 50,000 shows is being sold, 100 reels at a time in the Bargain Basement. Escape was one of radio's best shows from the Golden Age of Radio beautifully restored to crystal clarity by the exceptional staff at Radio Archives. Brian Donlevy was one of the Silver Screen's popular Actor's for many years and then also popular on radio, especially with this series, Dangerous Assignment. It is about as fast paced; as any radio show could get with exceptionally well written stories and intriguing plots. I greatly appreciate your audio editing efforts to create virtually noise free programs in all your old time radio programs. While some listeners are oblivious to the noise, I greatly appreciate and applaud your efforts. Thank you. The Radio Archives Newsletter is emailed every Friday morning and features all the NEW products released by Radio Archives this week! The products in this newsletter are just a small fraction of what you'll find waiting for you at RadioArchives.com. 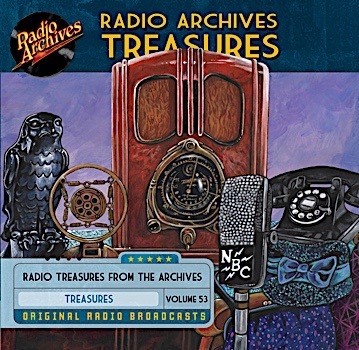 Whether it's the sparkling audio fidelity of our classic radio collections, or the excitement of our pulp audiobooks and pulp eBooks, you'll find fifteen hundred intriguing items at RadioArchives.com. If you no longer wish to receive our newsletter, or if this newsletter has been sent to you in error, please reply to this e-mail with the subject line UN-SUBSCRIBE and your name will immediately be removed from our mailing list.